How do I become a Certified Sleep Consultant? Have you thought about becoming a baby sleep consultant but have no idea where to get sleep consultant training? I know, the information about sleep consultant certification and training is very limited and difficult to find. 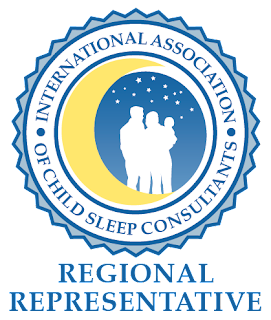 Currently there are only a handful of sleep consultant certification programs available. Through the years of sleep consulting, I have been asked by several of my clients to train them in what I do so they can become sleep consultants too! This is an amazing career, so I can definitely understand the interest. I get to help sleepless parents all over the world, while still being home with my two little girls, not missing a single thing. By becoming a sleep consultant you have the amazing job of giving sleep-deprived parents the gift of sleep. Not only is it rewarding, but it enables you to meet and work with wonderful parents and their families. I’ve found a great deal of joy in helping people all over the world, and I believe you can too. So, if you are passionate about sleep topics and parenting, then you would be a great sleep consultant. The only thing I ask for is a willingness to work hard. In turn, I will do my very best to make sure you understand every concept and will share all of my secrets and tricks of the trade. 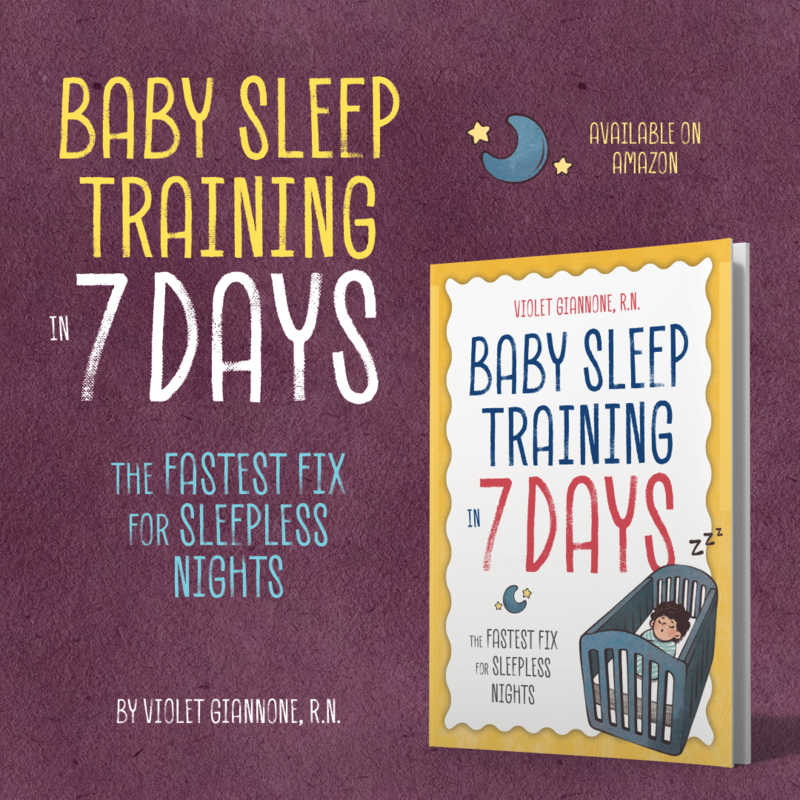 The Sleep, Baby, Sleep® consultant training program is taught by Violet Giannone, a Registered Nurse, Pediatric Sleep Consultant, Published Author of Baby Sleep Training in 7 Days, Regional Representative for the International Association of Child Sleep Consultants, and Owner and Founder of Sleep, Baby, Sleep®, a very successful pediatric sleep consulting company. The program is approved by the International Institute for Complementary Therapists. You will be learning about infant and toddler sleep, sleep troubles, client coaching, putting together sleep plans, and anything else that you need to start and run a successful business. Through this program you will learn how to be a successful sleep consultant, how to get clients, and how to market yourself and your business. To ensure your success, I’ve partnered with an instructional designer to create this course and all of the assessment pieces. They’ve been designed to give you a 360° view of your progress. The content has been taken from real clients and the assessments and assignments build from simple to more complex, so when you graduate you’ll be ready to deal with real-life situations. The course contains 7 self-paced modules that you can complete at your own pace. You’ll learn about the biological basis for sleep, the progression of infant and toddler sleep, sleep troubles and why they arise, various sleep training techniques, how to coach your clients, how to create customized sleep plans, and how to set up and market your business to attract clients. Through this program you will learn how to be a successful sleep consultant, and how to market yourself and your business. You’ll also have access to me as I share in detail how I’ve helped so many clients through the years) as well as a peer group of other sleep consultants to help and support you throughout your journey. You’ll learn about the most important aspects of infant and toddler sleep as it relates to sleep consulting. 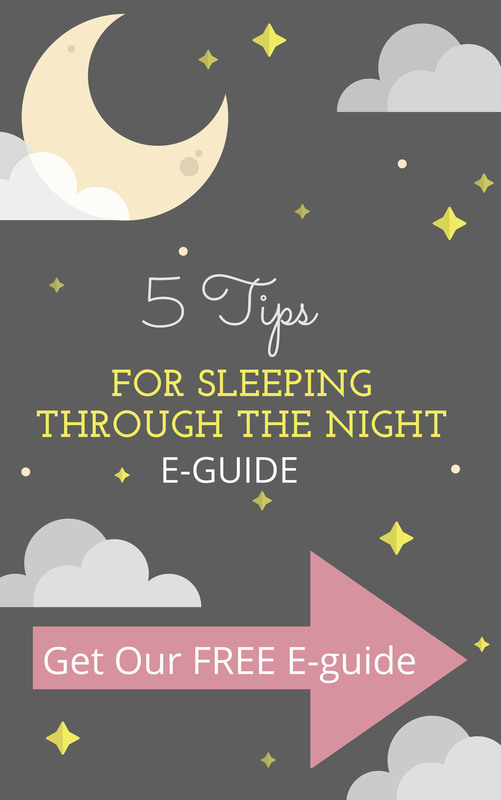 Because sleep is such a vast topic of lifelong learning, we will be focusing in on the information that you need to consult. You’ll learn about the biological basis of sleep including the stages of sleep, sleep cycles, and about the brain changes that occur during child development that affect sleep. You’ll also learn why sleep disturbances happen and how to use your knowledge to coach your clients as to what to expect. You’ll learn about what’s normal at various ages and about common sleep problems at these ages. You’ll be able to help your clients with bedtime struggles, frequent night wakings, early morning wakings, pacifier and sleep prop dependency, sleep regressions, short naps, how to handle crying, and so much more. You’ll learn about various sleep training methods and techniques, We focus on proven gentle and intermediate techniques but also give you information on Cry It Out techniques should you wish to use them in your own practice. You’ll learn to coach parents on how to handle tears. You’ll learn about common roadblocks and bumps clients will come across and how to handle them, including teething, separation anxiety, night weaning, illness, growth spurts, and regressions in relation to developmental milestones. You’ll learn exactly how to create and customize successful sleep plan. You’ll get a sample sleep plan with all the components, and we’ll guide you in how to create templates you can easily and quickly customize. Sometimes, sleep training may not be an appropriate solution, or you may not feel comfortable consulting with a client. You’ll learn how to handle these situations and when to refer your client to another professional. You’ll learn the basics of setting up a legal business, about services to help you with business cards, banners, ads, bookkeeping, insurance, liability, technology (how to create client intake assessment forms, how to start your website, how to find clients through digital marketing), and anything else that you need help with. Successful completion of the course will be demonstrated by completing required reading and tests, working through case studies, watching required videos, and engaging in discussions in the discussion board. The course is designed to be taken at your own pace, so there will be no rush to get everything done at once. I know many of you are busy at home with your little ones, so I created this course to be flexible. There will be a final exam at the end that will require you to put together all of the information that you have learned throughout the course and create a sleep plan based on one of my current clients. You will also be required to come up with responses to their questions. Don’t worry, you will have plenty of time to prepare. 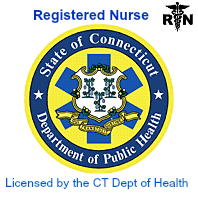 A certificate of completion will be issued once all of the requirements are submitted and passed. If you are having trouble passing a requirement, we will work through it together to make sure that you are successful. You will be able to print your certificate as soon as it is issued. 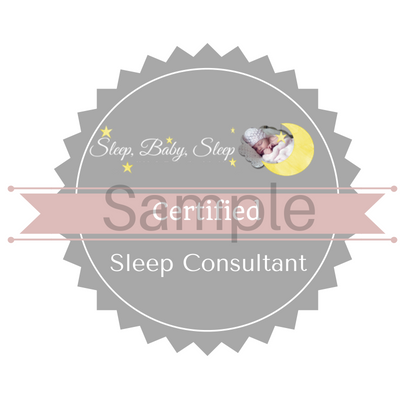 You will also be given a Sleep, Baby, Sleep certified logo for business use on your website and marketing material to show your sleep consultant training and certification. Outside of the wealth of information I will be giving you, I’ll be available to you every step of the way to guide and support you. I will make sure you are confident and ready to go out and be a great sleep consultant. I will work with you on your first clients for six months, or until you are ready to do it on your own. I will also help you set up your website, help you with sleep plan templates, and anything else that you may need. You will also have access to a members only online social support group. This group is comprised of individuals at various levels of education. From sleep consultant students to consultants who have been in the business for over 10 years. Parenting educators, nurses, teachers, postpartum doulas, infant specialists also comprise this unique group. All of which you will be a part of, and will have the ability to learn from. We discuss client scenarios, discuss marketing strategies, talk about the latest sleep research, offer each other resources, share documents, and so much more! This very active and unique group is invaluable. You will have a support group from the moment you sign up for this course. All prices are in USD. Payment deferment and other flexible payment options are available. 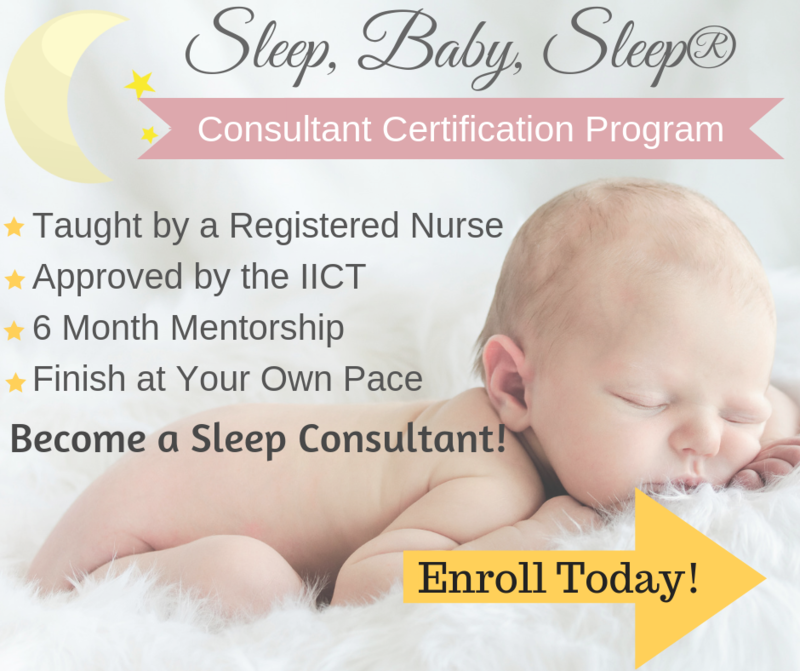 The Sleep, Baby, Sleep® Sleep Consultant Certification Program was created to be affordable and attainable. Because I know you have a true passion for helping sleepless parents and their babies, I didn’t want the cost of tuition to hold you back from your dream of being a successful, fulfilled, amazing certified sleep consultant. I’ve been given this life-changing opportunity, and I believe it should be attainable for everyone who has a true passion for this field. You will not be charged a yearly membership/certification fee. Most other programs charge $250-$1000 USD annually to maintain your certification. With me, tuition is all you’ll every pay for the Sleep, Baby, Sleep certification program. With lifetime access to the course materials, you’ll get all the latest updates and research to stay up to date. If you want to become a sleep consultant please fill out the short application and I’ll contact you to discuss your goals and how I can help you on your journey. You can also view the full Sleep, Baby, Sleep Consultant Certification Program Website. Meet Violet, the advisory board, and get more details about the course.